| Price: Rs 400/- pp xxviii, 151 | Illustrations: 164. THE BEGINNING OF 1993 saw two significant events in Indian architecture. The INGCA and OUP made available five essays by Ananda Kentish Coomaraswamy (1877–1947) which were earlier inaccessible to the public. The other event was the theme chosen by the National Association of Students of Architecture (NASA), India, “Back to the Roots” for their national convention held at Bhubaneshwar, Orissa (now Odisha). Though it may not be perceptible, very few are aware of the Indian ethos in different areas of creative life and expression. But at the end of 20th century, with the imminent fall of ‘industrial civilization’ (or ‘economic civilization’), the awakening of ethnic identity is a global phenomenon. Parallel to the environmental movement, there is a ‘Anti-celebration to Columbus Day’ all over the world, and a new awareness in different disciplines. The essays by Coomaraswamy reappear when people of India (not the statisticians) are groping for salvation in an ever-increasing chaos. The much sought-after development aping the west has only worsened the living conditions of the people of mainstream India. While this book may pamper the inflated Indian ego, it may be life-saving plank to multitudes in 20th century modernity called consumer civilization. The common theme of the essays is to present a picture of secular, domestic, urban, rural architecture of India 2000 years ago, the remains of which do not exist because of impermanent nature of materials used. The book is about how the common man’s architecture, a hut of a villager that became a source – a form-giver – and developed into a unique architectural style, complex structural system and highly developed building vocation – into a tradition that materialised in thousands of and continued during the late medieval period under royal patronage (Chapter IV. Huts and related temple types, P 103). For instance, “Tree-cult”, tree worship which was adopted by the Buddhists in “Bodhi-gharas” was an animistic practice of the people before Aryans came (Chapter II. BODHI-GHARAS, P 19). Though Coomaraswamy does not mention so, the “Tree-cult” still exists in India in different forms, for example, “Tulasi-vrindavan”, holy Basil (Ocimum sanctum L.) on a platform or in a pot, is a common feature of the Indian household. The plant is known for its medicinal values and is also an organic insecticide. “Brahman” – a banyan tree with a built platform, is a common feature of villages in Konkan region – a well known monsoon forest region on the West Coast of India. 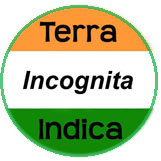 “Devarai”, sacred grove, is a “protected forest” by the people for the Indian villagers and forest dwellers, by unwritten law of ancient tradition, though not recognised by the development projects, or by the British-made “Forest Acts” that still continue in modern India. Why Tree-cult? Coomaraswamy has not posed this question here. Did some visionary scientists or wise men of the aborigine communities initiate tree-worship as a measure of environmental protection? A. K. Coomaraswamy opens up the first essay on “Cities and city-gates, etc.” with a statement, “…cities are despised and there are no ceremonies for urban life”(P.3). He quotes “It is impossible for one to obtain salvation, who lives in a town covered with dust” (Baudhayana Dharma Sutra, II, 3, 6, 33). Elsewhere he says, “…but the village is still typical centre of Aryan life” (History of Indian and Indonesian Art, p 15) referring to Maurya period. Indian society has remained agrarian even under the wave of industrialization. Among several features of city, Coomaraswamy describes city-gates: toranas and gopuras, which were used for protection and security or for honorific and ornamental purposes. In contemporary times, Mr Shankar N. Kanade, architect, has used city-gates in “Jala Vayu Vihar” township at Bangalore (now Bengaluru), enhanced by adding elevated water storage tank. In present day context, more than being ornamental it gives identity to a place in urban chaos; it is a symbol of celebration, besides utility. Indian Architectural Terms (P. 71 – 99) is a critical essay on two books written by Prof. P. K. Acharya, “Indian Architecture According to the Manasara-silpasatra” and “A Dictionary of Hindu Architecture”. It is a combative but constructive criticism. This essay helps to learn ‘how to criticise and how to take it, and gives access to ‘meanings’ of the terms. Take the term much in currency these days, Vastu, for example: “Vastu, add the meaning, “real estate” (Meyer, “Liegenschaft”): “Vastu includes houses, fields, groves, bridges (or ghats, setu-bandha), ponds and reservoirs,” Arthasastra, III, 8” (P. 97). He has presented over 100 sculptured relief works in photographs and drawings – some of them restored in exquisite drawings by him, as visual evidence, from monuments built in or carved out of rocks centuries ago. The author referred to textual evidences from Sanskrit, Prakrit and Pali law books, epics and Kavya literature. These reliefs were executed by sculptors, guilds of master craftsmen who documented epics of Indian civilization on stone surface. It is worth noting that the sacred texts were handed over by mnemonic method, though writing was known, for reasons of accuracy, which is still being observed. In the relief sculptures there is no scope for errors or adulteration or manipulations. The population of India around 1st A.D. was perhaps 30 million or so, with growth rate of probably less than 0.01 percent per annum. As the feudal power over people increased, which is now growing to a global scale through its invisible tentacles, the epic writer in stone is now visibly disintegrated. What happened to the guilds as the population grew? For instance, the communities of stone-cutters called “Wadar” and “Beldar” living in the slums of cities and towns not far from the famous monuments of Karla, Bhaja, Elephanta, Kanheri etc. and several forts in Maharashtra. Are these the descendants of the guilds of the ancient times? Just as the Brahmin descendants of the sages – Vashishta, Agasti, Vyas, Bhrugu, Vaishampayana etc. whose pedigree has been maintained by the high caste? 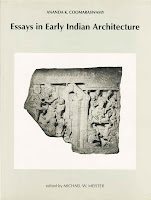 What Michael W Meister probably missed in the conversation with Joseph Rykwert is to give 20th century parallel in modern architecture to A K Coomaraswamy’s thesis of “primordial hut as a form-giver” to historical Indian Architecture (Afterword: Adam’s house and hermits’ hut: A conversation, P. 125) . In the twentieth century modern (western) world architecture there are only “master form-givers”, whose works go down as second hand and third hand imitations to the masses: Indeed a true expression of economics of Industrial Civilization that give the fruits of its development and progress, prosperity and powers to the society by the “trickle down formula”. This formula is also applied to the education system to support industrial civilization. In today’s context, awareness of environment, ecology and energy which are being destroyed at unprecedented rate, Coomaraswamy’s work of timeless quality is all the more relevant, a ground prepared for ‘further work’. It is a book for all: scholars and architects, planners and politicians, pundits and leaders alike: a collector’s copy. It may also help a new vocabulary – a new form of expression to emerge – a departure from twentieth century architecture and other disciplines (born and developed in the West); a restoration of dignity of labour; a change in planning parameters; a right to manage their own affairs to the local communities. What John Papworth calls, “Democracy after all does not mean government for the people; it means government by the people. We hope, in Coomaraswamy’s words, “…mark a final victory of the conquered over the conquerors” (History of Indian and Indonesian Art, P. 5). ks in transition (P. 103). Thanks for making us little bit acquainted with @ hindu/Indian architecture. Expecting more on same topic. There are more reviews of events and books on this and my other blogs. For example, a review of "Yaksa", a book by Coomarswami, a book on mud buildings etc. Thanks a lot for your generosity..............Sthapati Architects, Specialises in Traditional architecture in Chennai. We have also designed Temple architecture in Chennai. Thank you Sir, for visiting my blog. My best wishes for your valuable work.